This is a guide to connecting to an MCECS stash using Ubuntu Linux. These instructions can be easily adapted to other Linux distributions. Stashes can be accessed through the command line on an MCECS machine by navigating to “/stash/stash_name”, where “stash_name” is the name of your stash. Note that if you try to list the contents of “/stash”, nothing will be visible. You will need to `cd` to /stash/[the name of your stash] specifically to see your files. 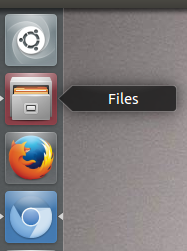 To use a graphical interface to interact with your stash, you can use Ubuntu’s file browser. Move your mouse to the top left of the desktop and click the Ubuntu logo, and search for nautilus. Or You can click the folders icon on the left (Unity sidebar). A window will open, and you can type in the location of your stash in the address bar. This is “/stash/stash_name”, where “stash_name” is the name of your stash. Then hit Enter to connect. If you’d prefer to use the command line to connect to your stash from off campus, know that stashes can be found in the /stash directory of any cecs.pdx.edu machine, including stash.cecs.pdx.edu. Note that if you try to list the contents of “/stash”, nothing will be visible. You will need to `cd` to /stash/[the name of your stash] specifically to see your files. There is an FTP client built into Ubuntu’s ‘Nautilus’ file browser. We will use it for this tutorial. Open a file browser like before, then place sftp://stash.cecs.pdx.edu/stash/stash_name where “stash_name” is the name of your stash. Then hit Enter to connect.